The new JL Jeep Wrangler hasn’t been on the market very long. It doesn’t take very long for some folks to modify new vehicles though. Most Jeep Wrangler buyers would stop at new bumpers, new wheels and tires, and suspension work. If your modification tastes are more extreme, you can cram a V8 under the hood. A company called Bruiser Conversions in Florida will put a Chevy LS3 crate engine into the Wrangler for you. The company says that the Jeep factory ECU can control the engine and sync it with other systems. What that means is everything on the Jeep still works. The conversion uses the JL’s standard 8-speed auto transmission. We have to wonder about the durability with a big V8 replacing either a v6 or turbo four of modest power and torque. It’s not clear if manual JL Wrangler owners can partake the engine swap or not. 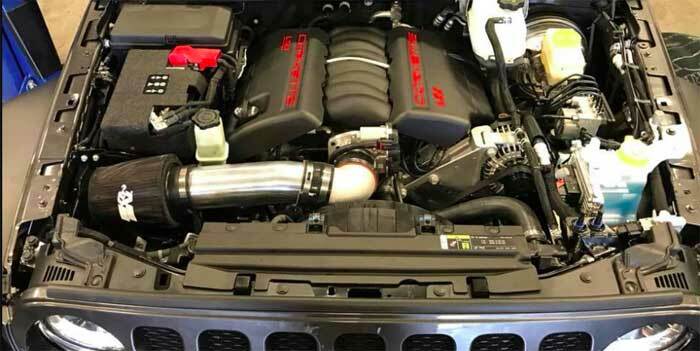 The price for the swap is $24,500 for a 450hp version or $27,500 for the 500hp version and includes the engine and all labor, bring your own Wrangler.